No proposal under consideration to replace the National Pension System (NPS) with old pension scheme - Govt. replied in Lok Sabha. 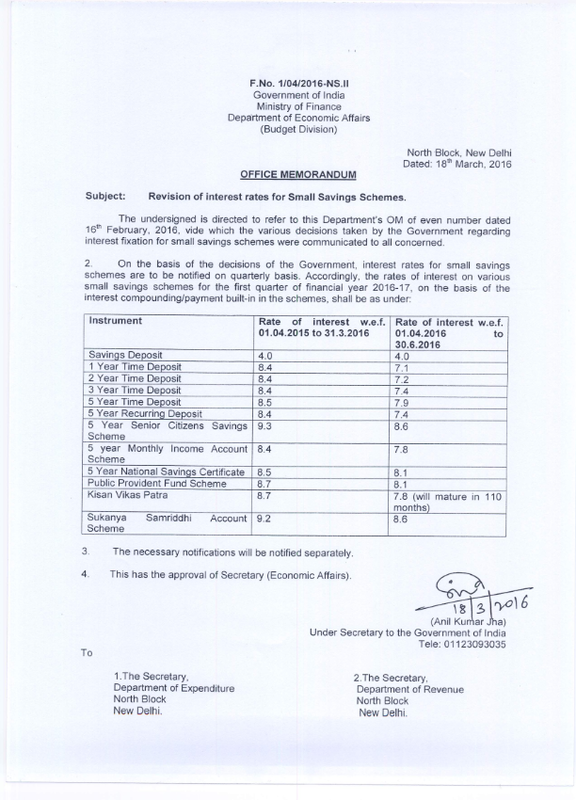 Declaration of Assets and Liabilities by Public Servants under section 44 of the Lokpal and Lokayuktas Act, 2013 - Filling of Returns by public servants on or before 15th April, 2016 - regarding. CABINET APPROVES 6% HIKE IN DA FOR CENTRAL GOVT EMPLOYEES. The Union Cabinet, chaired by the Prime Minister Shri Narendra Modi, has approved release of an additional instalment of Dearness Allowance (DA) to Central Government employees and Dearness Relief (DR) to Pensioners w.e.f. 01.01.2016. This represents an increase of 6 percent over the existing rate of 119 percent of the Basic Pay/Pension, to compensate for price rise. This will benefit about 50 lakh Government employees and 58 lakh pensioners. 2. Welcoming the members of E-CoS and JCM Staff side, Cabinet Secretary observed that the meeting had been called to take a note of concerns of Stäff-$ide of JCM regarding recommendations of the 7th CPC and invited the members Of Staff-side of JCM to share their views on the recommendations. (v) Recommendation regarding withdrawal of non-interest bearing advances may not be accepted. (xi) Recommendation regarding PRIS need not be accepted as no scientific mechanism has been devised to assess the performance of employees and the same could ecourage favoritism. 5. Issues regarding financial upgradation under MACPS in promotional hierarchy without grading stipulation. grant of two increments on promotion introduction of Productivity Linked Bonus, treating Grameen Dak Sevak as Government employees, removal of pap of 5% on compassionate appointment 8i full pay and allowances In case of Work Related Illness and Injury Leave improving promotional avenues for technical and supervisory staff etc. were also raised by members of JCM. After the initial comments from the Secretary Pension and the Secretary Staff Side, the items which had been subjected to discussion in the earlier meeting and the action taken statement thereon were taken up. The following were the issues that came up for discussion in the Action Taken Statement. 2.Cashless treatment to CGHS beneficiaries by empanelled private hospitals. The health Ministry officials stated that since the budgetary provisions are made separately for each Ministry it was not possible to ensure cashless treatment to serving employees. The concerned Department or Ministry has to enter into agreement with the hospitals. 3.Finalisation of Family pension cases within a specified period. It was stated by the official side that the instructions have already been issued. Regarding the complaint from the M.P. Circle of the Postal Department, the matter has been taken up with the concerned authorities on 6.2.2015. The representative of the Postal Department said that the complaint has been attended to and the matter has been settled. 1. Grant of Gratuity on retirement/death of a Central Govt. NPS subscriber. The representatives of the Pension department said that the Department of Expenditure has given their concurrence for the grant of Gratuity for the NPS subscribers on 8.1.2016. The requisite amendment to the rules, they added were being processed and the consultation with the Law Ministry and the Labour Ministry have already been made. They said that they would expedite the issuance of orders in the matter. 2. Extension of the benefits of full pension to pre-2006 pensioners who had completed more than 20 years of service but less than 33 years. The Staff side said that despite series of judgements in favour of the pensioners, the Government has not yet issued the orders. Recently the Nagpur Tribunal has issued a contempt notice to the Government. They also alleged that the pensioners are being dragged to litigation. The Representatives of the Pension Department informed that the Department of Expenditure had not agreed to extend the benefit generally to all which has resulted in filing appeal. The representative of the Department of Expenditure stated that in the light of the view of the Department of legal affairs, the matter would be re-examined. 3. 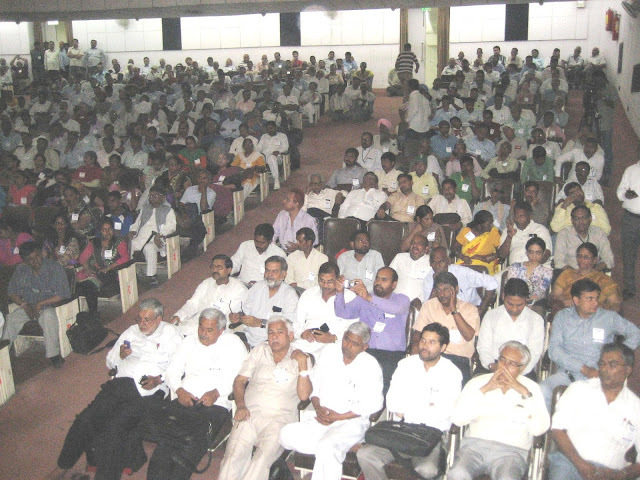 Delay in the finalisation of Family pension cases by the PCDA (Pension) Allahabad. In response to the complaint the representative of the Defence Ministry informed that only in a few cases, the finalisation has been delayed due to the documentation difficulties. They assured to sort out the matter. 4. Grant of modifed parity to all those who retired prior to 1.1.2006 with reference to the upgraded post. The Staff Side stated that the Department of Pension has taken a very narrow view of the matter and the cases are dragged to the courts of law. The very spirit of the recommendation of the 5th CPC to bring about atleast modified parity if not full parity has not been appreciated by the Govt. The issue was discussed at length. The official side pointed out the decisions of the Court in favour of the position taken by the Government in the case of K.S. Krishnaswany in CANO. 3174/3006, which has been upheld by the Honourable Gujarat High Court. In reply the Staff Side pointed out that the said decisions quoted by the official side had come about due to the phrase employed while issuing the original order viz. corresponding replacement scale. After some discussions, the Chairman agreed to look into the matter afresh and revisit the order of the Department of Pension in the matter. 5.The meeting also discussed the difficulties of Pensioners during the hearing of Pension Adalats. The Staff Side pointed out the need to engage some knowledgeable person to assistant the complainants. The official side said that there had been no prohibition in the matter. The Petitioners are entitled to seek the assistance of another pensioner in presenting his case. If specific complaint of denial of this facility is brought to their notice, the Pension Department will issue the necessary instruction in the matter. The Supreme Court has ruled that scheduled caste (SC) and scheduled tribe (ST) members cannot claim quota as a right in government job promotions. This move was taken while rejecting a PIL seeking direction to the Uttar Pradesh (UP) government to grant reservation in promotion. In the landmark verdict, the apex court on March 11 said that the states were not constitutionally obliged to give preferential treatment to any community in promotion. A bench comprising Justice Dipak Misra and Justice Prafulla C Pant said that the government was not bound by any constitutional provision to frame a policy for reservation in promotion and the court could not order making reservation in promotion mandatory. Referring to Articles 16(4), 16(4-A) and 16(4-B) of the Constitution mandating socially affirmative action to help disadvantaged groups, the court said that the states were not compelled to make reservation for SCs/STs in promotion. It further said that the provisions allowed the government to exercise discretion and provide for reservation only after collecting quantifiable data showing backwardness of a class and inadequacy of their representation in public employment. According to Article 16(4-A), nothing shall prevent the state from making any provision for reservation in matters of promotion, with consequential seniority, to any class or classes of posts in the services in favour of SCs and STs which, according to the state, were not adequately represented. The bench refused to direct the UP government to carry out an exercise to find the representation of SCs/STs in government jobs in order to frame a policy for reservation in promotion. "The state is not bound to make reservation for SCs and STs in matter of promotions. Therefore, there is no duty. In such a situation, to issue a mandamus to collect data would tantamount to asking the authorities whether there is ample data to frame a rule or regulation. This will be in a way, entering into the domain of legislation," the bench said, according to TOI. The bench further said that the Constitution granted discretionary power to the government to frame law for reservation in promotion and they could not be forced to bring regulation on the issue. "The courts do not formulate any policy, remains away from making anything that would amount to legislation, rules and regulation or policy relating to reservation. The courts can test the validity of the same when they are challenged. The court cannot direct for making legislation or for that matter any kind of subordinate legislation," the bench said, while rejecting the PIL. REVISION OF INTEREST RATES FOR SMALL SAVINGS SCHEMES W.E.F 01/04/2016. Reiteration of the instruction on streamlining the procedure for verification of claims of candidates belonging to SC/ST and OBC for purpose of appointment to posts/services - reg. New Delhi, Mar 8 (PTI) In the face of all round attack, Finance Minister Arun Jaitley today completely rolled back the controversial proposal to tax the employees' provident fund (EPF) at the time of withdrawal. Taking the first opportunity available, he made a suo motu statement in the Lok Sabha in which he also announced withdrawal of imposing monetary limit for contribution of employers to provident and superannuation fund of Rs 1.5 lakh for taking tax benefit. Jaitley, however, left untouched the proposal tax exempt 40 per cent of National Pension Scheme and services provided by EPFO to employees. Ministry of Personnel decides to allow non entitled employees to travel by air and claim LTC restricted to fare entitlement. New Delhi: All non-entitled central government employees have been allowed to travel by air while availingLeave Travel Concession (LTC) with a condition that reimbursement in such cases shall be restricted to the fare of their entitled class of train or actual expense. The Ministry of Personnel had recently eased norms for processing claims of LTC -- which allows grant of leave and ticket reimbursement to eligible central government employees to travel to their home towns and other places. "Government employees not entitled to travel by air may travel by any airline. However, reimbursement in such cases shall be restricted to the fare of their entitled class of train, transport or actual expense, whichever is less," an order issued by the Ministry said. The move comes after the government received a number of queries in this regard. In many cases, employees did not have railway station or good road network to their home towns and they had requested for permission to travel by air to save time, which was being denied, officials said. Now, they will be allowed to travel by air and by any airline, they said. At present, those entitled to travel by air have to mandatorily travel by Air India. A government servant may also apply for advance for himself or his family members 65 days before the proposed date of the outward journey and he or she would be required to produce the tickets within ten days of the withdrawal of advance, irrespective of the date of commencement of the journey, as per the new norms. There are about 50 lakh central government employees. All central government employees have been asked to share photos and interesting details of their holidays. The DoPT has decided to put a limit of one month for verification of LTC claim after the LTC bill is submitted by government employee for settlement and final payment. "Efforts should be made to reduce the duration of processing of LTC applications or claims at the earliest. The maximum time limit should be strictly adhered to and non- compliance of time limit should be adequately explained," its directive said. 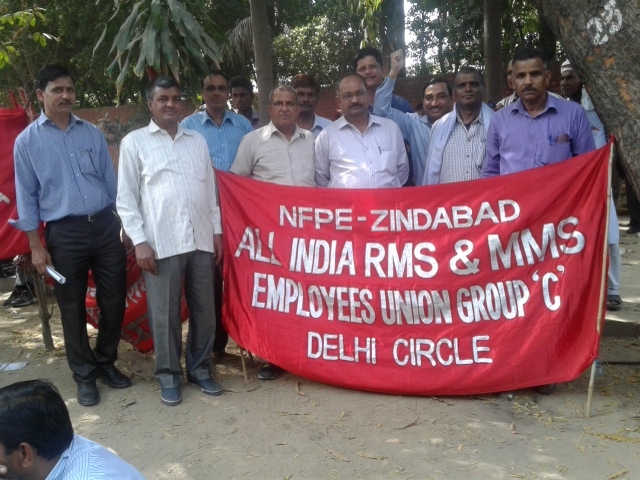 NJCA meeting held at JCM (NC) staffside office on 07th March 2016, after detailed deliberations has decided to postpone the indefinite strike date of 11th April 2016 and strike notice serving date of 11th March 2016 to 11th July 2016 and 09th June 2016 respectively. The following are the reasons which necessitated the change in dates. a) While summing up the discussion on Charter of demands held on 1st March 2016 by Empowered Committee of Secretaries (ECoS) with JCM National Council Standing Committee members, Cabinet Secretary has stated that reasonable time should be given to the Government for a fair consideration of all the demands raised in the Charter of demands, since the issues concern inter-departmental consultations. b) After declaration of the Election schedule in five State Assemblies, the Election Code of Conduct has come into effect. Further there will be polling on 11th April 2016 (strike commencement date) in West Bengal and Assam. 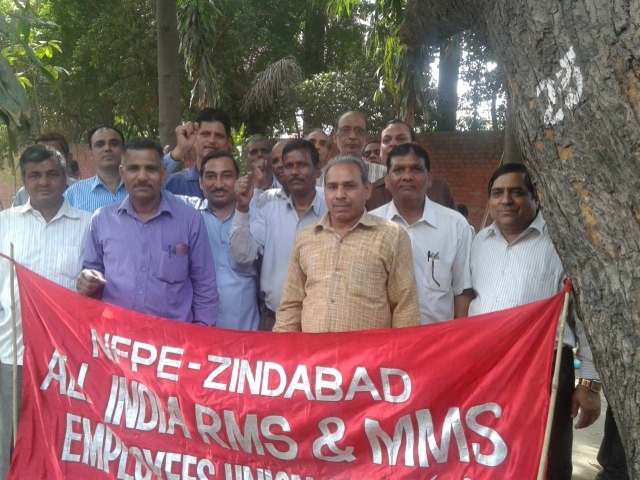 c) As per Section 22 of Industrial Disputes Act 1947 with regard to the validity of strike notice is not more than six weeks from the date of serving the strike notice. Even if we give strike notice on 11th March 2016, for commencement of indefinite strike after the election dates (ie 20th May 2016), the six weeks period will be over by that time and we have to serve fresh strike notice again. 1. The indefinite strike shall commence from 6am on 11th July 2016. 2. Strike notice would be served on 09th June 2016. 3. Massive demonstration shall be held in all workplace on 11th March 2016 in support of the charter of demands and strike decision. 4. The decision of the NJCA would be communicated to the Cabinet Secretary. 5. Detailed mobilization programmes would be given later on. Copy of the NJCA Circular dated 07th March 2016 and letter addressed to Cabinet Secretary dated 07-03-2016 are enclosed herewith. In view of the above decisions, the state C-O-C level joint meeting of office bearers / committee members of C-O-Cs and affiliated organizations of Confederation scheduled earlier will be rescheduled after NJCA mobilisation programme is finalised. 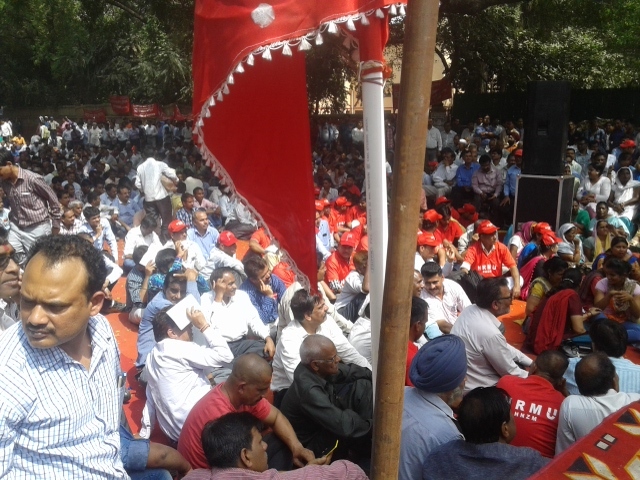 Department-wise campaign and mobilisation on charter of demands (Common demands plus Department specific demands) shall continue. 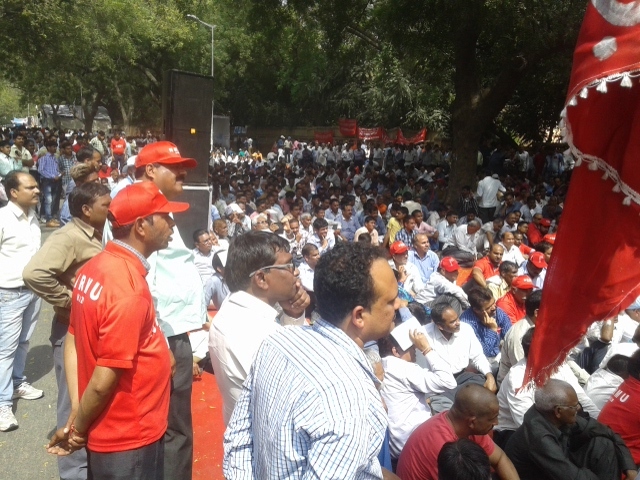 The Central Trade Unions in their meeting held on 27th January 2016, besides deciding to stage All India Protest Day on 10th March 2016, also decided to hold National Convention of Workers towards the end of March in New Delhi to discuss and decide on next courseof action programme against the anti-people and anti-labour policies by the Govt. The convention will now be held on 30th March 2016 at Mavalankar Hall, New Delhi. The convention will commence at 10.30 am on 30th March 2016. All C-O-Cs and affiliated organisations of Confederation are requested to make the 10th March 2016 All India Protest Day a grand success jointly with other Central Trade Unions. Regarding National Convention on 30th Marfch 2016 the C-O-Cs in and around Delhi are requested to ensure maximum participation of Central Govt Employees in the Convention. 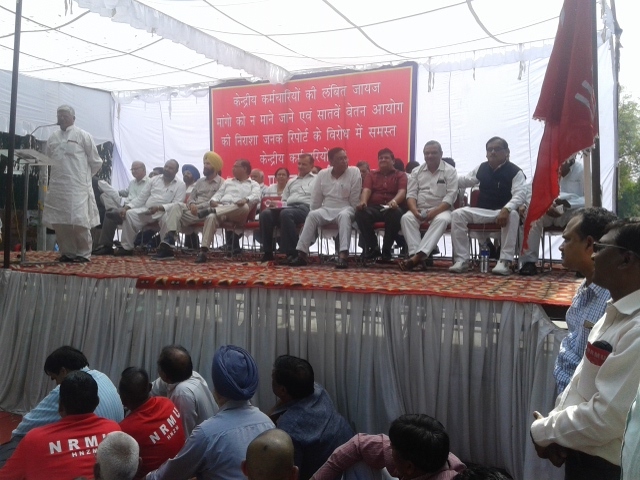 National Secretariat members of Confederation, who are available in Delhi shall also attend the Convention. Copy of the joint statement issued by Central Trade Unions is enclosed herewith. 1. To demand modern, efficient, quality, universal and free public services, to answer the real needs of the workers and people, against their outsourcing or privatization, refusing its use for the accumulation of profits by the oligarchy. 2. To demand the repeal of all rules affecting the rights of Public Administration workers in the countries where they are imposed. 3. To demand improvements in the working and living conditions of the Public Administration workers, namely better wages and work times compatible with their personal and family life. 5. To exercise the right of Trade Union freedom (association, meetings, demonstration, participation etc) in all workplaces and the right to negotiation and collective bargaining. 6. To implement social policies that answers the interest of the people and workers for a fairer distribution of wealth, with the rejection of charitable social policies. 7. For the rejection of all neo-liberal policies and austerity that in various parts of the world seek to destroy the labour and social rights of workers and people. 8. To struggle for peace and internationalist solidarity against war, militarism, aggression, interference and blockades that undermine the interests of the wokers and people – in defence of national sovereignty, for the people to freely decide their destiny. 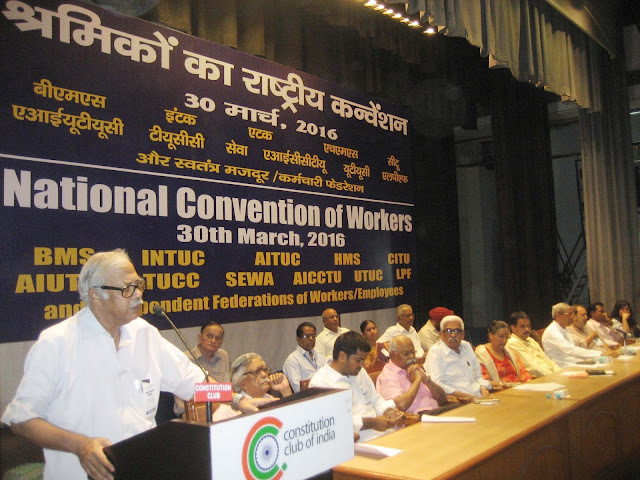 Confederation National Secretariat call upon all C-O-Cs and Affiliated organizations to observe 4th April 2016 as “World Day of Struggle against Privatisation” along with All India State Government Employees Federation (AISGEF) and Bank / Insurance Associations and Federations.